A beginner-friendly course in Rosenberg’s approach for creating harmony with your words. Our words have the power to create profound healing or incredible suffering. Yet even with the best intentions, it is often difficult to express ourselves in ways that build harmony and trust. Speaking Peace presents a seminal four-part model you can use immediately to connect to the spirit of love and generosity within you, and start contributing to the well-being of everyone you relate to. 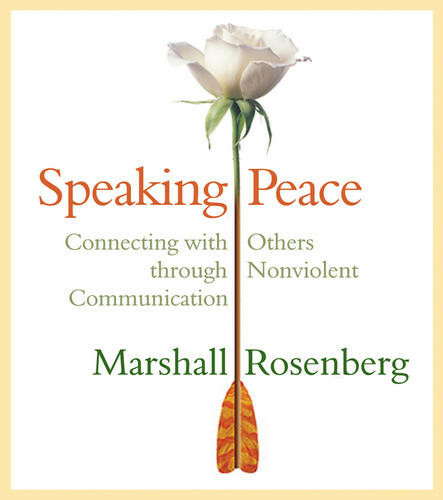 For over 40 years, visionary author Marshall Rosenberg has used the process of Nonviolent Communication to help families, schools, businesses, and governments reach accord in seemingly impossible conflicts. How to see through the eyes of others to foster understanding, and more. Marshall Rosenberg teaches that when you convey what is alive in you, your true feelings, and the values and desires behind them, you establish honest, nurturing relationships that eventually fulfill everyone's needs. With Speaking Peace, learn how to align your speech with your heart's purest depths. I bought this book for a very practical reason (and because I knew it would be useful in many ways): I had to participate in a meeting in which I knew there would be people I see as my enemies, people who are very aggressive, verbally abusive. I wanted to be prepared not to get angry and not to respond in the same way, and after listening to the book twice I did it. I was very happy with myself, and very grateful with Marshall Rosenberg, because I still remeber his calm voice going through the dialogues he puts as examples. As a psycotherapist I also learned vey practical ways to manage anger which I can share with my clients.